The subwoofer is well known and people think that its effect is more immediate and the bottom range is immediately highlighted. The correct reproduction of the lowest range is very important to get a correct sound and we have good reasons to believe that the ultra high range is just as important, and may give incredible results. Once used the supertweeter, and if you do not listen only to standard CDs with a maximum frequency response of 22 kHz, it is very hard to do without. 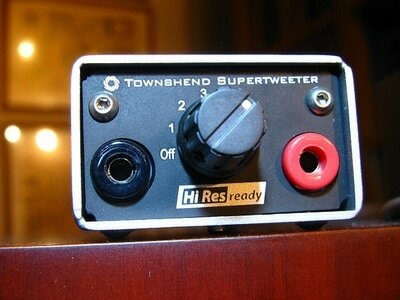 I want to specify that talking about supertweeters I mean components that go beyond the 20/30 kHz. This is not going to be a long review, I do not have enough elements to write a lot. I may also deal with the scientific reasons that make these supertweeters important for every ear, even ears that are a bit damaged by the age. What I'd love to do is to arouse your curiosity about these drivers. I'm not the kind of person that wants to convince you no matter what; I love to discuss and to talk about audio and music with audiophile friends. In this case I want to talk about the supertweeters and about the changes that generated in my, and I want to stress my, system. There are two driver brands involved, and I think that two are enough to give us an idea on how and if supertweeters work. 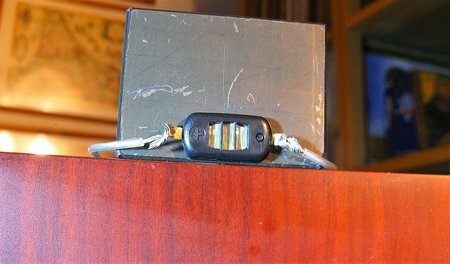 They are small and very lightweight: all you need to do is to connect them to your loudspeakers binding posts. The impedance is around 4 kOhm and it does not stress the amplifier. The stated frequency response is between 20 kHz and 150 kHz. The output level is factory set and all you have to do is to connect them to the binding posts, put them close to the loudspeaker tweeters (as you can see in the picture I have stuck them to a block of graphite, a limited edition of Q-Dampers by Art). The position that I suggest is central, aligned to the original tweeter. 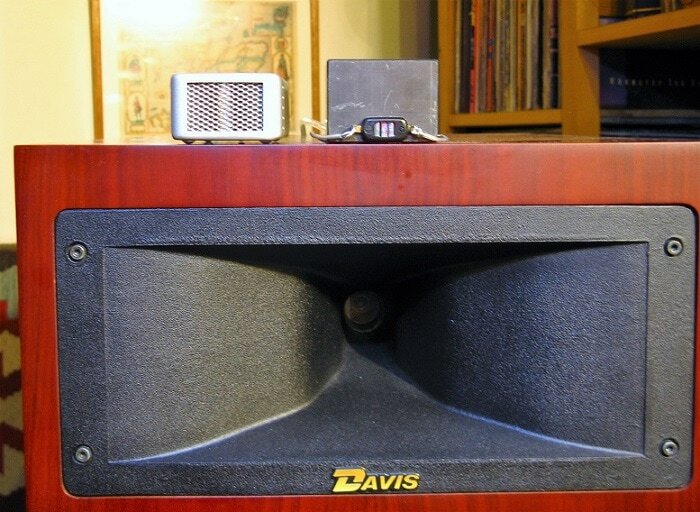 I have obtained the same result both with the Davis Monitor Ones that use a compression horn loaded tweeter and with the cheaper PSB Alpha B1s. 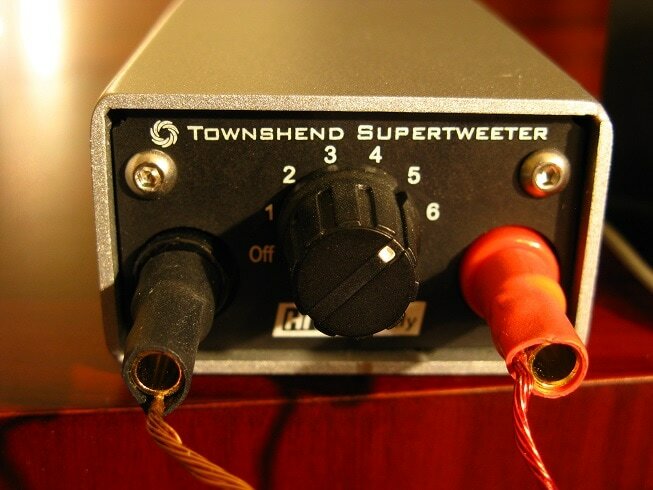 Townshend are a device with an accurate manufacture, provided with good cables and with the possibility to adjust the output level and to switch them off when desired. Like the Japanese TakeT, they use a ribbon driver but the magnet is very different. The former are much more expensive than the latter and very different, of course. 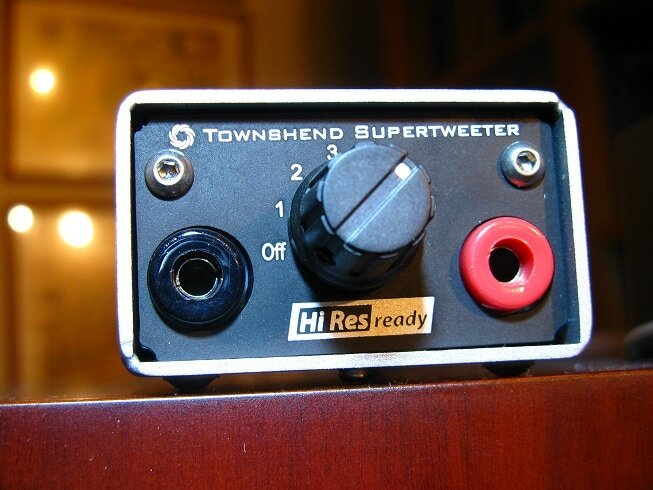 As for the Townshend they must be connected directly to the loudspeaker binding posts and their frequency response reaches 90 kHz. The 89 dBs sensitivity is quite low and the output level can be set through a rotating commutator positioned behind the box, in six different positions. The power handling, once connected to the system, is quite high and it is around 500W max. The MSRP is around 1.100 euros for the couple, here in Italy. Let's talk about these devices once connected to my system. The TakeT Batpures change immediately the sound; the timbre of each instrument seems more accurate. 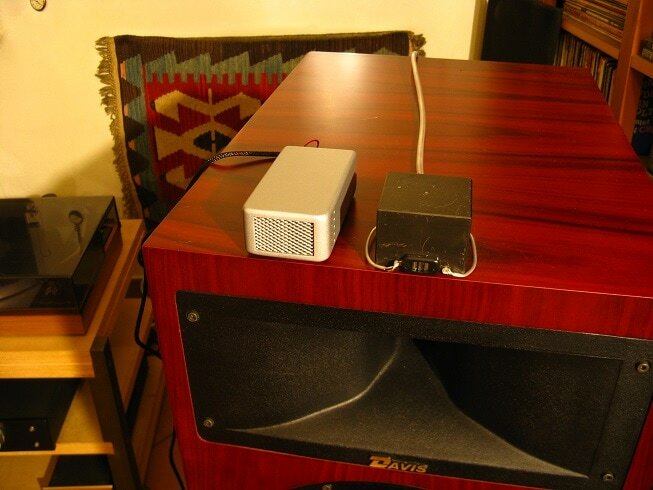 The sound is more airy and as a consequence the soundstage is more defined and larger. During the first days of use they result a bit too sharp but with the use the sound becomes more refined and well integrated. There are no gaps in the sound, it is almost impossible to understand where they start working but the sound results more natural and defined, never unnatural. They do not modify the timbre of your loudspeakers, if the recording is bad you will have a bad result but if the recording is good it will be a real pleasure to have them connected. Listening to the music for organ (Miller & Kreisel, Toccata and Fugue in D Minor by J.S. Bach in the LP that contains also the Fanfare of the Common Man by Aaron Copland) you can hear the small pipes very clearly and they result less annoying than ever. The same result we have with all the instruments that play in the high range, and the definition of all sound ranges is improved. What happens if you do not use them? The sound seems to be less natural. Not exactly limited in the top range but it seems to be missing something. That something that made everything clearly distinguishable. Everything gets back to an ordinary reproduction, without them. With the Townshend? 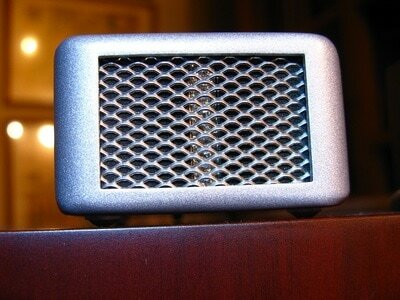 Their intervention is less sharp, the extension of the frequency response is softer but still convincing and noticeable. Let's say clearly that they perform better than the TakeT, and this is predictable, given the difference in cost; moreover, the fact you can vary the output level according to your system, it is very useful because it also allows to better tune their intervention depending on your listening room and on the efficiency of the loudspeakers which they are matched. The effect on the soundstage is even more striking than with the small Japanese supertweeters; perhaps thanks to the larger surface of the ribbons, the scene takes on greater proportions, environmental resonances assume an entity such that the acoustics of the recording place is almost understandable (some would say the exact size, but it seems a not credible hyperbole). An example of how supertweeters reproduce the environmental resonances (where present in the recording, always remember): with the Arvo Part Miserere, after the prayer of the people (that fortissimo in which percussion, trumpet, tubular bells and organ play together), the music stops suddenly. Environmental resonances, well perceptible with my loudspeakers, extinguish more slowly when you use the TakeTs and even more slowly with the Townshends, until arriving the complete silence. In the analog recording Missa Bell'Amphitrit Altera Orlando di Lasso, a beautiful recording, Argo pressing, the resonances move from right to left, depending on which group of singers is singing, with a great reconstruction of the performance; so that in the night, when you can't listen at loud levels, you feel you are in a beautiful cathedral with very high ceilings. With both supertweeters the effect is more noticeable with vinyl, SACD and high resolution files. When you listen to CDs the result is not so good. Indeed, it seems of little use to connect something that extends the frequency response beyond 20 kHz when the CD is filtered at 22 kHz. Obviously the dispersion on the horizontal and vertical plane is not exceptional; both TakeT and Townshend have a narrow dispersion and you will have to point them directly to your ears. The TakeTs are excellent regardless of price, you can buy them to get accustomed to this kind of product. The Townshends are a mature, definitive product. What should you do, then? Regardless of ypur age, if you are interested in the small TakeTs, you can click on manufacturer's website, order and pay them, wait three weeks to receive them at home and start having fun (I do not know the delivery times of the French distributor, but I am told they are shorter). If you prefer the most elegant, performing and also beautiful Townshends, you can contact your local Distributor.